Russia opposes the emergence of new organisations in Central Asia that could rival Russian influence in the region, Interfax reported on Tuesday. Instead, Moscow refers to the Shanghai Cooperation Organization (SCO) as the sole instrument to combat terrorism in Central Asia. We can tackle the tasks of resisting and fighting terrorism together in the framework of SCO and Russia does not support the establishment of organizations comparable to the SCO in Central Asia. --- The establishment of a parallel entity would be a barrier to cooperation. We don't need pressure or compulsion wherever they may come from. When asked about the meaning of this, Gryzlov pointed at the US, which he accused of having plans to set up a parallel organisation to the SCO in Central Asia. Apparently, Moscow fears increased US interest in the region, whereas perhaps Washington would not see anything wrong in a little bit of sound competition. However, it is becoming painstakingly clear that the two old partners in the fight against terrorism are rapidly drifting apart in what is becoming a new Great Game in Central Asia. This is not exactly the news one might expect coming out of Moscow these days, but it is the impression that one may get by a passing glance at a recent Interfax telegramme. The story is that the railway link between Moscow and Tbilisi has been restored after a 13-year long disruption. 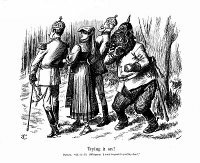 However, with a little fantasy, it may also give a certain twist to current political relations between Russia and Georgia. Evidently, trains will leave Tbilisi for Moscow three times a week, starting last Saturday, and passengers will have to go through the discomfort of a detour via Azerbaijan. This is so, because the direct line to Moscow has been out of service since the start of the Abkhaz conflict in 1992. Even though the newly reopened Tbilisi-Moscow connection is not via Abkhazia, negotiations are underway between Russia, Georgia, Armenia and Abkhazia, to reopen also the line running through Abkhazia from Yerevan via Tbilisi to Moscow, possibly as soon as within two years time. That the link between Moscow and Tbilisi now has to go by detour and not directly may be a mere coincidence, but can also serve to signify the general character of current political relations between Russia and Georgia. In August 1991, Estonia regained its lost independence after nearly 50 years of soviet occupation. Some 15 years later, Estonia and Russia still lack regulated borders. Last year a border agreement was finally signed, but it did not take long before Russia withdrew from the treaty - something next to unprecedented in international relations. Since then, a stalemate persists between the two countries as relations thus reached a dead end. What will it take for Estonia and Russia to sort out their differences? Russia is ready to sign formal border treaties with Estonia, Latvia and Lithuania. I hope this will not be accompanied by some idiotic territorial demands. In today’s Europe, in the 21st century, one country making territorial demands against another, at the same time wanting to ratify a border treaty - this is complete nonsense. However, this is more or less what happened, at least according to Moscow's version of events. Whereas the Russian parliament - the State Duma - was hesitant to ratify the border treaty, anticipating trouble, Tallinn moved on. Eager to get the question off the agenda before vacations, the Estonian government also put the treaty before parliament - the Riigkogu. Reactions to this were negative from the very outset, as many parliamentarians held that the government thereby tried to force through the treaty without proper discussion and debate. To be passed, the bill had to get a 2/3 majority. Such majority suddenly seemed unable to reach, why the government preferred to enter negotiations instead of facing certain defeat. These negotiations resulted in a separate preamble or declaration to the border treaty, referring to the Tartu Peace Treaty of 1920, by which Soviet Russia recognised Estonia's independence within the pre-WWII borders. 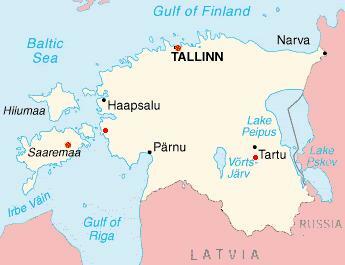 However, current borders have been revised during soviet reign, which makes Tartu references unacceptable for Russia. With this preamble, the Estonian parliament passed the ratification. Moscow's reaction was predictable to say the least. On June 21, Russia's Ministry of Foreign Affairs stated that it would not put the treaty before the Duma for ratification. Then, during a visit to Helsinki at the end of June, foreign minister Lavrov declared that Russia had decided to revoke its signature from the border treaty. This is also what happened, and on 1 September president Putin formally withdrew Russia from the treaty. The move to withdraw from an already ratified treaty is next to unprecedented in international relations, and must be considered a very stern reaction. The scandal, a few years back, when president Bush revoked the US signature from the treaty on the International War Crimes Tribunal has reverberated in the international community ever since. Examples are scarce, because the international outcry for doing so is expected too great, and one has to pay too high a price for it to be worthwhile. Still, this was exactly what Moscow chose to do. Why did the Estonians act in this way, if they clearly understood what the reactions from Moscow were to become? What were they to gain from this? Some suggestions have been made, although they fail to explain for - even in combination - Tallinn's action. One factor is that Estonia in April 2005 went through a government crisis and that the sacked prime minister and leader of the Res Publica party, Juhan Parts, quickly needed to profile himself with some cause, not least after a failed unification of Estonia's two right-wing parties - Res Publica and the Reform Party. Thus, demands connected to the border treaty seemed as a convenient opportunity for Res Publica. Another reason is that the foreign minister of Ansip's new Reform Party government - 31-year-old Urmas Paet, simply was too new and unexperienced on his post, why he could not manage to deal with Moscow and domestic political intrigues at once. A third explanation, is that government coalition partners - not least the Social Democrats with their grey eminence Thomas Hendrik Ilves at a safe distance in Bruxelles - stood to gain from a squabble between the two right-wing parties. Then, there is Estonian politics' black horse of Edgar Savisaar and his Centre Party. Being the new minister of finance, Savisaar was arguably the one pulling the real strings in cabinet affairs. Savisaar is a political survivor with a murky soviet past, who has been constantly scandalised over the years but always gets away without a stain on his popularity, especially among poor and rural population, including the Russians. Also, Estonian conservatives are usually quick to point out that the Centre Party is in union with president Putin's United Russia, thereby casting suspicion on him for being on Kremlin's leash or even - at times - payroll. Finally, it must have been hard to put off Russian interests, though not necessarily Russia itself, from the temptation of exploiting Estonia's domestic difficulties in this situation. Whether the Russian factor could hold on to itself in not giving in to such an urge will however remain unclear. The effect was though in Russia's interest. Thus, Estonia stood to gain nothing, but to once again be portrayed by Russia to the great powers of Europe as an amateur in international relations in disrupting the treaty. Still, blaming Moscow is simply too much of going through the motions to be taken seriously. 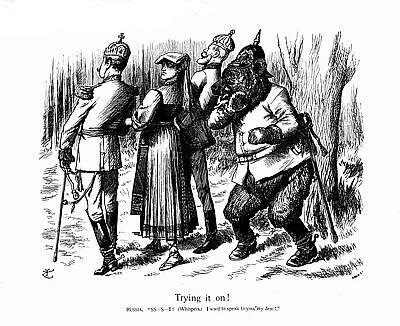 Perhaps, Russia in reality simply had to stand idly by while the Estonians themselves fumbled about in torpedoing the treaty. So, is there any way out of this mess for Estonia? At an OSCE-meeting earlier this spring, foreign ministers Lavrov and Paet discussed the need for resumed negotiations to settle the border issue once and for all. Some discussions have also been held since, but both parties seem to agree that a ratified treaty will not come into force in the foreseeable future. The issue is simply politically dead at the moment, while so much prestige was put in on both sides to finalise the border settlement. Once this was lost, little room was left for future talks. Estonia thus seems to have little choice but to let the issue at rest for the time being. In view of the current situation, how should Estonia handle its relations with Russia? Professor Andres Kasekamp, director of the Estonian Foreign Policy Institute, believes that Estonia now will opt for an EU-solution. According to Kasekamp, Estonia should take the CFSP/ESDP more seriously. This is also currently the sentiment among many politicians in Estonia. The country seems intent on playing out the EU-card, despite the Union's demonstrated inability to stand firm on Russia. Such a policy thus seems to have a weak foundation in current realities. That Sweden and Finland were the only other EU-states in support of the Estonian position concerning the border treaty, is a telling example of how little the EU cares about Estonia's relations with Russia. EU politicians are simply fed up with the whole affair of Estonia not being able to conclude a border treaty with Russia for the last 15 years. EU-support thus seems destined to fail, and EU's European Neighbourhood Policy appears to offer little use to Estonia, as it does not comprise relations with Russia. The alternative of handling relations with Russia through Nato should, in this perspective, seem all the more tempting to Tallinn. Such a method would, in reality, mean using the US and the Transatlantic link to influence NATO-policy. In May 2005, president Bush visited Riga, and among other things discussed subjects such as democracy and freedom in Eastern Europe. This kind of US high-level discussions is in the best interest of Estonia, while statements to this fact facilitate setting the Nato-agenda in Tallinn's favour. 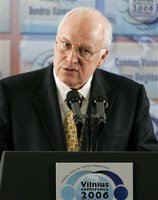 US vice president Cheney's speech at the May 2006 Vilnius Conference also signalled a change towards a more critical stance in US policy towards Russia. In November this year, Riga will host the annual Nato Summit, offering an opportunity to further Estonian interests in relations to Russia by proxy of Nato. Estonian chances to bandwagon with the US to deal with Russia through Nato are therefore greater than ever. Still, Tallinn strangely enough seems to prefer the EU option - perhaps reflecting the post 2001 change in Nato's geographical focus. What Estonia fails to recognise is the fact that also within Nato, the tide is changing in relations with Russia. Tallinn should clearly not miss out on this opportunity to use a change in US and Nato policy towards Moscow in its own favour. Finally, a joint approach in coordinating Estonian interests on Russia to concurrently influence both Nato and the EU in the same direction might be a recipe for success, but this is simply too complex a task for a small country to pull off. In the meantime, the Russian question in Estonia continues to drag on as an annually recurrent tradition. The drama has been played out by more or less the same actors over the last 15 years with little variation. This year's incident was the 20 May desecration of the Bronze Soldier Monument (Pronkssõdur) by Estonian nationalists. For Russians, it is a memorial to Soviet soldiers who died fighting in World War II. For Estonians, it is a symbol of the Soviet occupation. Therefore, in connection to Russia's victory day each year, soviet veteran ceremonies at the monument are ritually followed by protests from Estonian nationalists. This year, events have been especially serious with a string of demonstrations. Among Estonian nationalist demonstrators were crackpot professional dissidents such as Holocaust-denier Tiit Madisson, but also more respected people such as former commander-in-chief Aleksander Einseln. Their objective is the removal of the Bronze Soldier from central Tallinn, and little consideration is taken to reasoning in view of their unwavering demands. The situation has been exploited by extremists on both sides. Last week, the headline of the leading Russian newspaper in Estonia, Vesti Dnia (fmr. Sovetskaya Estonia), read: "On the Brink of Civil War." Also, rumours about Russian vandalisation of Estonian monuments, e.g. in Tartu, are spreading, and the resurfacing of old Interfront activists has been quite unexpected. Probably, protests will peter out in a few weeks, but it is worrisome that extremists repeatedly are allowed to set the political agenda for almost a month each year. This is simply not a sound political tradition for a small country like Estonia. Protests and demonstrations may well be overlooked by the majority of Estonians as an annual freak event, but each year extremists are allowed to set the public agenda through media. When one refers to the situation of Russians in Estonia or Latvia, one should be aware of the fact that this does not necessarily mean Russians as such. Migration to Estonia in the post-war era came from all over the Soviet Union, why it might be as natural to come across a Tajik, a Ukrainian or a Lithuanian in Tallinn as it is with a Russian. Today, they all meet the same conditions and requirements for residence permit and citizenship no matter what their place of origin might once have been. That Russians are in a majority should not serve to hide this fact. Estonia's Russian-speaking population is concentrated partly to Tallinn and neighbouring cities, and partly to Eastern Estonia. However, it is in the East that the Russian dominance is especially compact - in cities like Narva and Kohtlajärvi. For long, crisis has coincided with ethnicity in this part of the country, which incidentally also neighbours on the disputed border areas with Russia. Unemployment and social malaise have been a constant feature in Eastern Estonia during the last 15 years. A destitute population with little hope for the future has presented a great problem for Estonian authorities. The city of Narva, right on the border to Russia, facing Russian Ivangorod on the other side of the river, is a telling example. In reality, the few Estonians living in Narva are state representatives in some capacity, and they associate little with the local Russian-speaking population. In Narva, it is perhaps no coincidence that the well-held offices of the Russian Consulate are located only a few hundred metres from the headquarters of KaPo - the Estonian security service. However, things are now looking brighter for Narva. The situation is still such that everyone who knows how to, tries to move away from the city. Many of the top students at Estonian universities originate from Eastern Estonia, strongly motivated from knowing that the alternative is poverty. This may not be the case in the future though. In recent years, things have begun to turn around for Narva. Unemployment has decreased and many industries are moving production to this area due to dramatically rising costs and a deficit of qualified labour in Tallinn and the densely populated areas of Western Estonia. The opposite to high costs and unskilled labour is exactly what Narva has to offer. Adding to this, the lower wages in this region attract a rising number of investors. Whereas activities still are far from bustling, the tendency towards a rather rapid development within the next decade is clear. 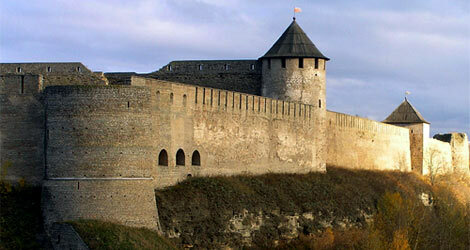 Until now, Narva's economy has largely depended on border trade with Russia. 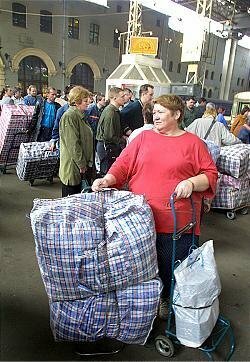 With much lower prices on petrol, alcohol, and tobacco in Russia, shuttle traders cross the border back and forth on a daily basis, bringing merchandise for illegal distribution and sal e on Estonian and Western markets. There are few figures on the full extent of this trade, but Russian customs' estimates say, that it accounts to some 20-30% of Northwestern Russia's foreign trade. There is no wonder then that transit-trade is Estonia's most profitable business, the proceeds of which have made great fortunes for the people who control it. Today, a majority of Estonia's richest businessmen are ethnic Russians. 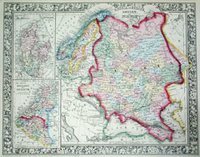 The paradox is that the population of Narva and Eastern Estonia has had little to gain from the shuttle-trade. Most of the money has ended up in the pockets of a few fellow compatriots that could not care less about the situation of their Russian kin. Therefore, the future of Narva rests on the opportunities to enter other economic areas. That a rising number of businesses in Estonia are now moving production to Narva is thus very promising. Too long, the level of costs has not been sufficiently geographically diversified to make it profitable moving industry to the East. Now, this has changed, why companies will seek to increase their dividends by lowering costs by relocation. In the meantime, however, a generation of workers has been lost to Eastern Estonia due to unemployment destitution. The old generation may be lost, but the new generation faces a much more promising future, which might allow them to stay on in their hometowns in the East. Things are changing in Estonia with 15 years passed since regained independence. A second new generation is entering the public and business spheres. This generation has little to remember from soviet times. The situation applies to Estonians and Russians alike. The arguments from nationalists and pro-Russia groups are increasingly perceived as artificial constructs with little relation to everyday reality. Both groups are themselves becoming as antiquated as oblivious. With economic development, also social and economic differences between Estonians and Russians will narrow, and so will consequently also the potential for extremists to exploit such friction. The focus of a new generation in Estonia is set on Europe and not on Russia. Relations with Russia are increasingly becoming irrelevant for most people in Estonia. Once this is realised, Moscow will have difficulties to exploit the situation of the "Russian minority" in Estonia in relations with Tallinn. 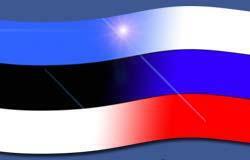 It will also become harder for Russia to raise support in Estonia per se by appealing to fellow Russians. Perhaps then, Moscow will definitely let go of its lost empire and plainly put borders and other issues at rest with Tallinn without further ado. However, also in Estonia it will take a new generation to sort out the country's differences with Russia, but in the end, Tallinn and Moscow will budge to the new realities. Yesterday, thirteen years had passed since the law prohibiting homosexuality was abolished in Russia. Yesterday, Russia's first pride parade was crushed by police. The event was carried through, despite an official ban on a LGBT-demonstration in the streets of Moscow. However, it seems that this opportunity to advance homosexual rights in Russia was lost by the Pride organisers. The Moscow Pride parade was preceded by a prolonged legal battle with authorities for the basic right of assembly and demonstration. Moscow mayor Yuri Luzhkov was among those that at an early stage tried to prevent Moscow Pride. This comes as no surprise, as the LGBT-movement has all the more become a target of populist politicians. Less than a month ago, right-wing demonstrators prevented a gay party in Moscow. So, what happened in Moscow on Saturday? In short, organisers decided to carry through the Moscow Pride march, despite a Friday court decision to prohibit it. In view of the legal battle and anticipated violent right-wing protests, the turnout was small - 50-100 people at the most. As expected, they were confronted by a much larger right-wing anti-demonstration of skinheads, Orthodox clergy, and general reactionaries. Also, more than 1,000 riot policemen oversaw the parade. Thus, it was the general setup for running the gauntlet for gay rights in Central and Eastern Europe, as witnessed over the last year with gay events in e.g. Warzaw and Kiev. The few brave LGBT-rights demonstrators started out facing the general bigot scorn and phsyical abuse expected in these parts of the world. All things alike, this is however where similarities ended. 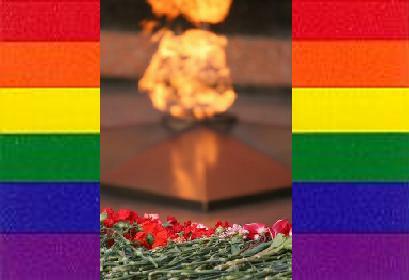 Approaching the Red Square, Pride organisers decided to go along with plans of laying down flowers at the Tomb of the Unknown Soldier, thus equating the fight for gay rights with the victims of the fight against fascism in WWII - Russia's Great Patriotic War. This was a provocation that Russian authorities could not accept, and the tumultuous reactions to this attempt led to the arrest of some 40 gay activists as well as 30 anti-demonstrators. Thus, the Moscow Pride parade was dispersed by riot police, under the close supervision of international media. Organisers must have been aware of the effect this was destined to provoke. Controversial actions at this national memorial next to always lead to stern police reaction. Having stated the facts, there is reason to question whether the Pride manifestation at the Tomb was in the best interest of the Russian LGBT-movement. The Tomb of the Unknown Soldier is Russia's most revered national shrine to the approximately 20 million soviet citizens who perished in WWII. Its fundamental significance to the relatives of victims of fascist oppression is something that goes far beyond politics. Therefore, any attempts at exploiting the monument for purposes other than commemorating the victims are regarded a grave sacrilege by most Russians. However, it is everyone's right to commerorate the victims of fascism at the Tomb of the Unknown Soldier. This right is even more important for homosexuals to be allowed exercising, not least while gay and lesbian rights are human rights. Fascist crimes against gay people during WWII were especially heinous, why LGBT-victims should be rightly revered. Commemorating gay victims of fascism deserves greater attention, and the issue has until recently largely been overlooked by historians and society alike. So, what was the purpose of laying down flowers at the Tomb of the Unknown Soldier? Was it "a symbolic protest to equate the struggle for gay rights with the struggle against fascism in World War II," as BBC reports, or was it to commemorate LGBT-victims of fascist aggression? Little evidence to support the latter is regrettably found. Being aware of walking a thin line concerning a discussion on the confines of exercising one's rigths, the question still deserves to be put, what the motive for this action was. Whereas there is no doubt whatsoever of the right of access for all to a national monument like the Tomb of the Unknown Soldier, exercising this right may prove disastrous to gay rights in Russia. If the intent of Moscow Pride organisers were to commemorate gay victims of WWII fascist oppression, this might well have aroused public sympathy. The right of commemoration is cherished among Russians, and focussing on gay victims could have brought a long overdue Russian moral self-scrutiny on equal rights in this regard to the public agenda. The alternative of instead equating the struggle for gay rights with the struggle against fascism, may to the contrary well have played into the hands of anti-gay forces in Russia. As long as the media version of events is the equation of struggling for gay rights with struggling against fascism, Russia's LGBT-movement stands to lose from this action. That there is little difference between the two, regrettably does not much matter, as the pedagogical task of explaining this is too great in comparison to the possibilities of actually doing so. The overall effect for the Russian LGBT-movement thus seems to be in the negative. Thus, already before the parade, gay.ru reports that it is a very controversial issue also within the Russian LGBT-movement. One gay activist's statement is telling: "This gay parade is actually making our life much tougher." Leading Russian liberal, Grigori Yavlinsky, has also turned his back on LGBT-rights in view of recent debate. Desperation brings desperate measures, and from this perspective, Moscow Pride's action may be understandable. The situation of gay people in Russia is close to desperate. Russia is a fundamentally homophobic society. A recent opinion poll shows that an overwhelming 73% of Russians are opposed to homosexual relations. Some 43% think that homosexuality should not only be criminalised but also penalised. Another poll showed that some 80% of Muscovites were opposed to the 2006 Moscow Pride festival. These are indeed harrowing figures on the situation for Russian gays. Thirteen years ago, homosexuality was decriminalised in Russia. Still, every year the homophobic lobby in the Russian parliament proposes that it should be criminalised again. Until now, a small majority has voted against such proposals, but the margin has narrowed in recent years. 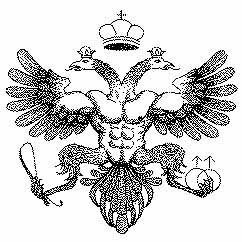 Historically, homosexuality was outlawed in Tsarist Russia. After the revolution, the communists legalised LGBT-relations, regarding the opposite "bourgeois prejudice." However, as early as in 1933, Stalin reimposed the ban, by introducing the infamous article 121 in the soviet penal code. Thus, homosexual relations could be punished by up to five years imprisonment. Since article 121 was abolished by president Yeltsin in 1993, liberalisation has regrettably come to a halt. Homosexuality and LGBT-rights are rarely discussed in public, and these issues are in practice suppressed by the tacit norms of Russian society. It is an alarming fact that gays are still regarded as perverts or psychically ill by most ordinary Russians. The 73% opposition against gay relations tells a lot about the situation. In this perspective, it was a brave and wise decision by organisers to go through with the Pride festival. They knew what to expect in words and violence, and still they did it. Giving in at this point would have meant that authorities and society never would have respected the equal rights of homosexuals. The long and arduous struggle for LGBT-rights in Russia has come to be epitomised by the 2006 Moscow Pride. International support has been massive and extensive. This was a pride moment that was too precious to be lost for Russia's LGBT-movement. It was a moment when Russian authorities should have looked down in shame for denying the people their constitutional and instrinsic rights. It was also a moment when Russian gays should have looked up in pride for trying to uphold the very same rights. Instead, the opportunity to exploit international support and improve public sympathy domestically was lost. The action at the Tomb of the Unknown Soldier was simply carrying the argument too far. The result was a tremendous anticlimax, which may negatively reverberate for Russian gays for years to come. Moscow lost its pride, but so it seems did also the Russian LGBT-movement. It is unlikely that Russian authorities will allow Moscow Pride parades in the foreseeable future. 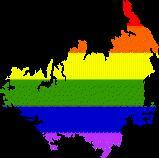 In 2010, the Russian LGBT-movement will host the XXV conference of the International Lesbian & Gay Association (ILGA). This is a great success for the movement, but the question is if there will be much progress for Russian gays until then. Conditions truly seem discouraging. Among this plethora of abbreviations, leaders of Georgia, Ukraine, Azerbaijan and Moldova (GUAM), met in Kiyev earlier this week to agree on forming the regional Organization for Democracy and Economic Development - GUAM, Ukrainian Journal reports. In effect, this means that the four countries are about to pull out of the CIS, as previously speculated upon. Formation of a new organisation is perhaps an overstatement of the results actually reached at the Kiyev summit. In essence, it simply establishes the final metamorhosis of the old GUUAM into a new GUAM, this time definitely closing the door to renegade member Uzbekistan. Thus, the GUAM-states will now proceed in cooperation within economy and free trade to form a bloc of peace, stability, and prosperity throughout the region. 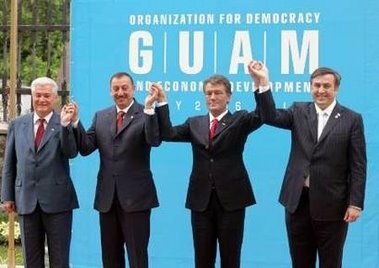 The Kiyev Declaration on Establishment of the Organization for Democracy and Economic Development - GUAM, states as its aim "the enhancement of democracy, adherence to the rule of law, respect for fundamental human rights and freedoms, economic development of States and assuring of security and stability." Great emphasis is also put on the importance to safeguard "sustainable supply of energy resources." The headquarters of ODED-GUAM will be in Kiyev. 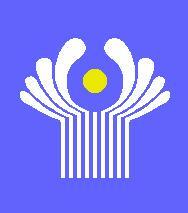 Its rival regional organisation - the CIS - leads a fading existence from its offices in Belarus capital Minsk. As the GUAM-states now seem destined to withdraw from the CIS, the Commonwealth may however gain a renaissance. With less internal opposition, Russia may want to use the CIS more as a tool in its policy towards the near abroad than was previously the case due to CIS-membership of the GUAM-states. Whether Moscow opts for such a solution is however far from clear, while Russia may prefer a unilateral policy towards its lost empire. What is becoming strikingly clear however is that reform-oriented nations of the former Soviet Union are forming a cordon sanitaire against Russia to curve Moscow's influence over its near abroad. Yesterday, a voice of freedom, justice, and democracy was silenced in Belarus. The Belarusian Helsinki Committee was finally banned by the Lukashenka regime, having fought a long and uneven struggle in defence of Human Rights. This leaves the people of Belarus without a champion for the individual rights and freedoms enjoyed by the bulk of European citizens. On Thursday, the Supreme Court decision to illegalise the Helsinki Committe was announced by Belarusian Ministry of Justice. Supreme Court judges are appointed by the president, why the decision to ban the Committee must be seen in this context. The Belarusian Helsinki Committee has fought a consistent and continuous battle for the observance of Human Rights in Belarus. Since last autumn, its activities have however gradually petered out in view of the regime's increasingly oppressive measures against it, drastically curtailing conditions for its mere existence. It therefore comes as no surprise that the Lukashenka regime now has taken the final step of closing down the committee by outlawing it. The pretext for the ban are accusations of Committee irregularities during the 2004 parliamentary elections, and breach of laws regulating NGO activities in Belarus. Last autumn, the Helsinki Committe was fined some 75,000 USD for tax evasion. Needless to say, most of the charges brought against the Committee have been fabricated by the regime. The ban testifies to Lukashenka's fear of the power of human rights and individual freedoms. He is probably right in this fear, as norms and values have previously proven a mighty power to change the minds of people in Central and Eastern Europe. The struggle for human rights was a contributing factor to the demise of the communist East bloc. Creating awareness of these issues led people to realise that: "We can no longer live like this - we have rights." 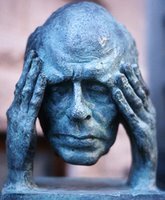 Little did Soviet leader Leonid Brezhnev realise that values and not weapons would become the crucial issue, when he in 1975 approved the Helsinki Final Act of the Conference on Security and Cooperation in Europe. Its third basket, dealing with individual freedoms, laid the foundation of a rights movement that was to contribute to the downfall of the Soviet Union and put an end to political oppression in the Eastern bloc. In 1976, the Moscow Helsinki Group was formed to make the Soviet Union observe its commitments from Helsinki, inspiring dissidents throughout the East bloc to follow in Czechoslovakia - Charta 77 - and in Poland in 1977. The inspiration from Helsinki initiated a movement today associated with names such as Nobel laureates Andrei Sakharov and Vaclav Havel, and fellow dissidents like Yelena Bonner, Adam Michnik, and Jacek Kuron. The Helsinki Final Act to this day stands out as a beacon for freedom and enlightenment in the eyes of the oppressed throughout the Eurasian hemisphere. By linking peace and security with the respect for human rights, soft security in the 1980s made the difference for change whereas hard security spiralled into an arms race threatening our very existence. Instead, by the recognition of universal rights, humanity became the salvation for mankind. Today, peace is secured but the Helsinki rights live on - as self-evident and inalienable as those of the American bill of rights. When Lukashenka now bans the Belarusian Helsinki Committee, it is because he understands that it is a threat to his power. What he does not realise is that ideas, norms, and values can neither be suppressed nor banned, while they rest in the minds of people. Lukashenka may deprive the people of their rights, but he cannot silence the voices of the people calling for freedom and justice. Instead, robbing the people of their rights only leaves them with a feeling that they are bereaved of what is intrinsically theirs. It only serves to further spur them to better know and act upon their rights and duties, and by exercising them bring about change. It is with this in mind, one realises that the ban of the Belarusian Helsinki Committee is yet another step towards a level of repression that in the end will produce a counter-reaction. 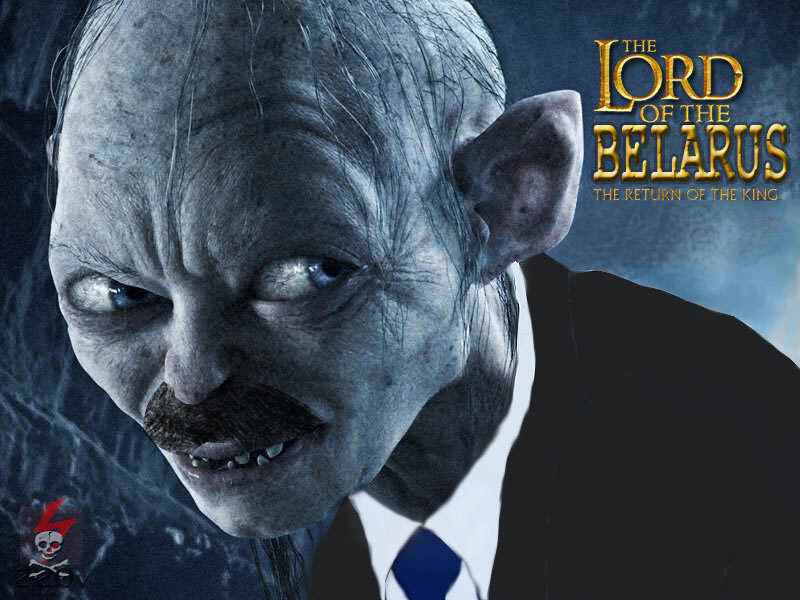 Sooner or later the people will rise to the challenge of reinstating freedom and democracy in Belarus. That day, come when it may, will inevitably mean the downfall of Lukashenka and his dictatorial accomplices. Russia is apparently having a new go at trying to reform its defunct military. So at least, BBC reports on Wednesday. Accordingly, "Russian Defence Minister Sergei Ivanov has announced sweeping plans to modernise the country's armed forces." Ivanov now declares that the number of conscripts will be reduced, whereas conscription per se will remain, although the model now seems to be leaning towards 3-year contracts. Attempts at creating a professional army have previously failed. 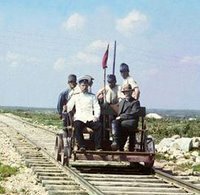 Also, some 30,000 auxiliary jobs will be cut, which is in line with international trends of military reform. What perhaps is most important is Ivanov's announcement that he will cut the number of generals and admirals by some 300 in the coming years. Cutting down the high brass may be the key to truly initiating reform of the Russian armed forces. Ivanov has for long fought an uneven battle with the General Staff, but in recent years he seems to have got the upper hand. Being the first civilian defence minister, he has met with much opposition by the military, not least because of his KGB-background. Renewed efforts at reform also comes in response to widespread public discontent with penalism and bullying in the army. If Ivanov is to become a serious candidate for the 2008 presidential elections, he must succeed in reforming the military both materially and spiritually. Increasing defence expenditure is however not the main solution to the problem. Changing the culture is. There is simply no idea of pouring more money into the black hole of Russia's defunct military. Getting rid of the human obstacles therefore seems as a necessary first step towards reform. A committment to development instead of maintenance can only succeed if all forces unite around a common vision on the military future of Russia. As long as the old brass stays on, reform is mission impossible. Reform needs mind as much as money. Today, Swedish Radio reports on a rising diplomatic dispute between Russia and Sweden. Recently, a Swedish diplomat in Moscow and a Russian diplomat in Stockholm were declared persona non grata by their respective host countries. Who made the first move in this reciprocal affaire is still unclear, but it only serves to further deter diplomatic relations between Moscow and Stockholm. In February, a Russian researcher at the Swedish University of Agricultural Sciences was arrested on espionage charges by the Swedish security police. This provoked stern reactions from Moscow, and Russian media claimed that the allegations were prefabricated. It was thus portrayed as simply yet another example of Sweden's increasingly Russophobic policy. Swedish media, on their part, reported that the Russian researcher had collected data on research and his fellow colleagues at the agricultural university for the Russian Embassy in Stockholm. The Russian researcher spent some time in police custody before facing spy charges. As his activities were not regarded as a rightout threat to Swedish state security, he was let off with expulsion from Sweden and the time spent in jail. The Russian diplomat that has now been expelled from Sweden was the embassy contact man of the "spy scandal" researcher. A reasonable assumption would thus be that Sweden made the first move in PNG:ing a Russian diplomat. However, this is not self-evident as Stockholm has tried to put an end to the mutual expulsions of citizens and diplomats as well as spy allegations that have tarred Swedish-Russian relations in recent years. However, if the Russian measure to expel a Swedish diplomat a few weeks back was a unilateral move, it would be somewhat out of the ordinary. Such a move would be in clear breach of diplomatic rules of reciprocity. Practice is that bilateral measures of this character are proportionate to each other. If so, the expulsion of an ordinary Russian citizen from Sweden recently, would then have resulted in a reply on the diplomatic level instead. Also, Russia's rigid practice of strict reciprocity, regardless of whether there is just cause, only adds to further straining relations. A telling example of Russian expulsions is that the current head of the East European branch of the Swedish Ministry for Foreign Affairs is among Swedish diplomats previously declared PNG by Russia. If Sweden this time made the first move, Russia's reply is, of course, simply business as usual in Moscow's diplomatic decorum. As is practice in such matters, little is said on the true circumstances surrounding an affaire like this. It must be noted however, that the number of Swedish citizens and diplomats expelled from Russia, seems to have been on the rise during recent years. The corresponding situation with expulsions of Russians from Sweden remains unclear, as Sweden often is much more discreet in these matters. Another spy scandal arose six years ago, when two Swedish defence researchers were arrested for espionage by Russian authorities on a very weak pretext. The incidence was concurrent to a general Russian tendency of not granting visas to security researchers from the Nordic countries. Also, Russia's increasingly disproportionate practice of reciprocity in expulsions has reached outside the realm of diplomacy. Thus, last autumn, Swedish State Television Moscow correspondent lost his accreditation in Russia with no explanation whatsoever, Kommersant reports. Rumours held it though that this was in response to not granting prolonged accreditation in Sweden to the correspondent of Russian newspaper Tribuna. The Swedish motive was that Tribuna's correspondent was paid not by his newspaper but by Gazprom, why he was no longer considered a journalist. The difference in status between a state television representative and a correspondent of a rather small newspaper is obvious, which only adds to the impression of disproportionate Russian countermeasures spreading from diplomacy to media and other areas. That both countries have to put an end to this negative development is obvious. The alternative would be further deterioration of Russian-Swedish relations. Sweden has long been r egarded by Moscow as one of Russia's greatest critics in the European Union. This should however not serve to conceal the fact that Stockholm's policy towards Russia has become increasingly conciliatory during the last few years. Thus, Stockholm now criticises Russia only in much severer cases of e.g. human rights' abuses than before. The difference is perhaps that there today is so much more to criticise in Russian behaviour. The threshold for critique has risen but so has also the number of severe cases. It thus seems that Russia and Sweden all the more are heading into a dead end in relations. It remains to be seen whether they will have the will and ability to turn developments around. The European Union on Thursday decided to freeze the assets of president Alyaksandr Lukashenka and those of 35 other leading Belarus politicians, AFP reports. The measure is a reaction against suppression of the opposition during the March presidential elections. According to the EU, all assets belonging to people responsible for breach of election rules and suppression of the democratic opposition will be affected. In April, the EU imposed travel restrictions for the same 35 people besides the president himself. Opposition allegations of election fraud have been met with stern reactions from the regime, including repeated police crackdowns on demonstrations. OSCE election observers found that the presidential election was severely marred by irregularities and outright fraud. On March 19, Lukashenka was reelected as president with an overwhelming 83 percent of the votes. The results only serve to strengthen the impression of dictactorial ambitions that have been a growing feature of Lukashenka's rule ever since his rise to power in 1994. Ukraine may eventually get a new government this week. Seven weeks after the March 26 parliamentary elections, Timoshenko again declares that she stands as victor and new Prime Minister. Thus, Timoshenko would reconquer the position she lost last year, by forming a coalition with Yushchenko's Our Ukraine, and Moroz' Socialist Party. In combination, the three parties control 243 out of the 450 seat in the Ukrainian Parliament, the Verkhovna Rada, as opposed to the 186 seat of Yanukovich's Party of Regions. Whereas such a coalition seems more natural than e.g. an unlikely government between Timoshenko and Yanukovich or Yushchenko and Yanukovich, it would not be an easy path to tread. Rivalries between Timoshenko, Yushchenko, and Moroz have previously led to politicial crises in the aftermath of the Orange Revolution, and this may become a recurrent phenomenon also with a new orange government. The road map that has led the way to, what could now become a new government, has created a common platform for political action between the three parties. Issues at stake are relations with Russia, WTO-membership, Ukraine's potential accession to Nato, as well as privatisations of state businesses and agriculture. Governemt talks have also been compared to reuniting a family after a lengthy and difficult divorce. A wild card in negotiations is obviously also ramifications of the new constitution, which entered into force on January 1 this year. Limiting the powers of the president, parliamentary power increases, e.g. by the right to appoint Prime Minister. According to the current coalition bid, Timoshenko's bloc will get half the ministerial posts, Our Ukraine a third, and the Socialists the remaining cabinet seats. It is also said that Moroz would become Parliament Speaker. How the actual division of the spoils will be in the end, however remains to be seen. Setbacks have been manifold up till now, so a repetition should not be ruled out, although the possibilities for renewed negotiations and solutions are quickly narrowing. According to the constitution, a government must be formed within 60 days of the elections. Today, 53 days have passed since 26 March, leaving a mere week to form a government. Time is simply running out, so the choice is to deal or die. At the core, coalition talks reflect a struggle between mighty interests over profits from the Ukrainian economy. Despite the progress won by the Orange Revolution, corruption is still endemic to Ukrainian society and politics, and this also applies to the parties that now might form a new government. It is essentially a question of who will get the billions of dollars that end up in the pockets of private interests, not least from the transit of Russian gas to the EU - now controled by the RosUkrEnergo company. As stakes are so high in getting a "fair" share of these proceeds, there is no wonder that the political struggle is so tough. Thus, forming a new government for these parties means to pay up or lose out on one's cut. To lose is not an option for either of the three parties, which perhaps is the main reason why a government eventually must form. The alternative would be to hand power and proceeds to Yanukovich, which definitely would leave the coalition partners with naught. Barring Yanukovich from power is thus what unites Timoshenko, Yushchenko, and Moroz. However, there are still a few "buts" before a new government is in place. The greatest obstacle is still Yushchenko's opposition against accepting Timoshenko as Prime Minister. Thus, as news of a government deal became public on Monday, a spokesman of Our Ukraine was quick to declare that the party would suspend talks in response to Timoshenko's statement that she would become Prime Minister and Moroz Parliament Speaker. Instead, Our Ukraine launched an unexpected candidacy of the Socialist leader Moroz as Prime Minister. The rationale would be that parliament might not want to accept Timoshenko as Prime Minister, which then would severely complicate any further possibilities of reaching a common solution. Our Ukraine's stern reaction was not unexpected. 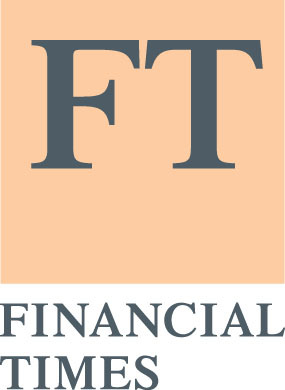 The party has repeatedly characterised Timoshenko's ambitions for the Premiership as an "ultimatum" in negotiations. Sooner or later, however, this is an argument that will not be taken seriously by anyone. The question now is, if the three potential partners have not reached a point of no return in negotiations. Having more or less struck a deal, Our Ukraine can no longer turn its back to agreeing on a solution. With almost two months since elections, the orange forces are reaching a decisive stage in negotiations when they must either unite or part. In the end, Yushchenko must most likely face realities and drink the bitter cup Timoshenko offers him, for the simple reason that he is running out of options. The alternative would be to part from power, if not from the presidency. It is now becoming painstakingly clear that Yushchenko can no longer perform a play to the gallery, and must admit that he plays too high a game. Now it's do or die - neck or nothing, and Yushchenko must swallow his pride by accepting Timoshenko, while next week might be too late. It remains to see whether Yushchenko will rise to the challenge or extend his role as election loser to that of lame duck as president. It all lies in Yushchenko's hands and how he decides will seal his fate in the history of Ukraine. Time is running out for him to show that he believes in, knows how, and can make a change for his country. 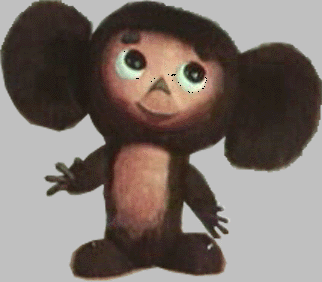 Cheburashka - a favourite animated figure from the soviet 1970's is about to have his comeback on the filmscreen. "After stealing hearts at the Turin Winter Olympics, the famed Soviet cartoon charater is about to become a movie star in Japan," Moscow Times reports on Friday. The question now is whether the heritage of a cult character like Cheburashka may be preserved in a contemporary version by a non-Russian moviemaker. For the generation brought up during the 1970's, Cheburashka and his accordion-playing companion Krokodil Gena, represent reminiscences of a happy childhood. The story of the small and unknown tropical animal - Cheburashka - that by chance is carried off from the jungle to Moscow in a crate of oranges, and his friendship with the lonely and not always so wise Gena, has fascinated generations of children. As any good adventure, there is an enemy as well - in the form of the mischievous but rather harmless Starukha Shapoklyak. Cheburashka first saw daylight in the 1966 childrens' novel "Crocodile Gena and His Friends" by Eduard Uspensky. As Cherburashka now turns 40, he is about to have his comeback as a major moviestar - this time in Japan. In 2001, the old Soyuzmultfilm cartoons, produced from 1969 up till the 1980's, were shown in Japan, attracting great popularity. However, Cheburashka's real breakthrough came in connection with the Turin 2006 Winter Olympics, where he acted as mascot - though in white winter fur - for the Russian team. Now a major Japanese film company has purchased the screen rights of Cheburashka to make it into a major motion picture. So now Cheburashka fans worldwide will live in great anticipation until the new Cheburaska is launched in a year or so from now. Still, one wonders if the Japanese will be able to live up to expectations among those who still have the soviet original cartoons as a point of reference - not to speak of the anecdotes. Images of cult phenomena like Cheburashka are not easily altered without public outrage. Only a couple of years ago, a new translation of Karlson na kryshe aroused massive protests in Russia. It remains to be seen how well the Japanese succeed in conveying that special character that so many associate with Cheburashka - a soviet childhood hero. Last Thursday 4 May, breakaway Georgian republic of Abkhazia declared its intention to join the Commonwealth of Independent States, Interfax reports. Reactions from Tbilisi and Kiyev were quick. Both Georgia and Ukraine now seriously consider leaving the CIS. Abkhazi leader Sergei Bagapsh stated that: "Abkhazia's priorities are membership of the Commonwealth of Independent States and further rapprochement with Russia." Last August, Bagapsh openly confirmed his ambition of "Abkhazia's secession from Georgia and de facto merger with Russia." Now he sets the goal to join the CIS by the end of the year, but "Abkhazia's further political and economic rapprochement with Russia is the central issue. We remain adherent to our proposals on Abkhazia's associated membership of Russia," Bagapsh concluded, according to Interfax. Bagapsh's declaration was immediately met with stern reaction from Georgia and Ukraine. Georgian president Saakashvili ordered his government to assess whether "it is worth remaining in the CIS," Nezavisimaya Gazeta reports. He went on to say that the conflict in Abkhazia back in 1993 had "forced Georgia to sign the declaration of joining the CIS." Now Georgia is seriously contemplating to leave the CIS. On Friday, Ukraine also for the first time officially declared that the country might leave the CIS. Kiyev has for long been disappointed with how the organisation works. Thus, speaking about a Ukrainian withdrawal from the CIS, Yushchenko's foreign policy advisor, Kostyantyn Tymoshenko, said that "if there are no results, the question arises." During last week's Vilnius Forum, president Yushchenko also characterised integration with the EU and NATO his main foreign policy objective, according to NG. Such ambtions might prove incompatible with remaining a CIS-member. A future for the CIS? This puts the future of the CIS even more in question than previously has been the case. Today, few of its members - not even Russia - have any great hope in the organisation. The original split in perceptions of its purpose, viz. political as opposed to economic cooperation, remains. The political aim is epitomised by the CIS Collective Security Treaty, signed by six countries - Russia, Armenia, Kazakhstan, Kyrgyzstan, Tajikistan, and Belarus. Turning to CIS economic cooperation, it can only be characterised as a resounding failure. Thus, demands were raised to find alternative to the CIS in lieu of its defunct economic record. In 1997, GUUAM was founded by the CIS-members not party to the Collective Security Treaty, with the single exception of Turkmenistan. GUUAM comprises Georgia, Ukraine, Uzbekistan (1999), Azerbaijan, and Moldova. Its aim was to fulfil the original purpose of the CIS by economic cooperation and free trade. Excluding Russia, GUUAM has remained on the second echelon of post-soviet foreign policy, and the organisation has been careful not to portray itself as a counterbalance to members of the Collective Security Treaty, although it seems evident that so is the case. Georgia and Ukraine have also been GUUAM's most eager members in pursuing a regional policy independent from Russian influence. Borjomi - a way forward? To take the matter further, Saakashvili and Yushchenko, last August, issued the Borjomi Declaration, calling on their neighbours to unite "efforts to turn the Baltic-Black-Caspian Sea region into a sea of democracy, stability and security, to make it a fully integrated region of Europe and of the Democratic and Atlantic community." In Moscow's eyes, Borjomi's outright western orientation was seen as yet another attempt to insulate Russia and curve its influence over the near abroad. Whereas there may be some truth to Moscow's contentions on this point, one should however not shy away from the paramount fact of the matter: Russia and the CIS have little to offer in comparison to the fruits of western integration. That Georgia and Ukraine are the first to publicly raise their concerns whether to remain CIS-members should therefore come as no surprise, as they have seized the opportunity of western integration offered to them by their coloured revolutions. All in all, one must conclude that there is more to the issue than simply a statement by a renegade republic leader. 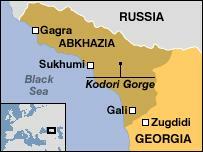 As for Abkhazia, the region broke away from Georgia already in 1992. This separatist republic remains unrecognised by the international community, and there is no secret that Abkhazia would not survive long without Russia's backing. For long, Moscow has remained ambivalent on how to deal with the issue. As the UN, the EU and the OSCE insist that Abkhazia is part of Georgia, Russia has been reluctant to recognise its de facto independence. Instead, Abkhazia has oscillated between outright independence and associate membership in the Russian Federation. Today, most Abkhazis hold Russian citizenship, facilitating a potential future incorporation into Russia. This is also what Georgia claims is Moscow's long-term ambition, making the issue an international bilateral conflict instead of an internal secessionist conflict. So, is it a mere coincidence that a statement by some half-wit chieftain of a secessionist region would seem to shake the foundations of the entire CIS? Why should Abkhazia's wholly unrealistic ambitions to join the CIS spark off such stern reactions from both Georgia and Ukraine? First, it is beyond doubt that the Abkhazi CIS-ambition is utterly senseless. It would presuppose Abkhazi independence, and even then CIS-members Georgia and Ukraine might still easily bar Abkhazia from membership. Second, one should ask why such a ridiculous statement is made specifically at this point in time, when the dividends of post-soviet space are are about to be paid to either Russia or the West. That Abkhaz leader Bagapsh's statement coincided with US vice president Cheney's critique of Russia at the Vilnius conference last week, shows that there is more to this than first expected. Third, the declared western orientation of Georgia and Ukraine - reiterated in Vilnius - serves only to underline the basic contradiction in clinging on to an imagined union by a post-soviet Commonwealth. From Moscow's point of view, the CIS is to little avail as long as the organisation cannot be used as an instrument for Russia's de facto power and influence over most CIS-countries. So, both parties want out. Georgia and Ukraine want to go west. Russia wants to rid itself of difficult CIS-members to better control the organisation. Fourth, were Ukraine and Georgia to leave the CIS, remaining members would, in the process, be left to the best of their abilities to deal with Russian dominance over the CIS. To conclude, it is remarkable how willingly Georgia and Ukraine swallowed Russia's bait - hook, line and sinker. Provided that considerations to other CIS-members do not prevail, it appears that Ukraine and Georgia will go west while the rest are left to their own devices. Going separate ways in concord is no loss. What such a split of the CIS may constitute, however, is part of a division of the spoils between Russian and US influence over post-soviet space, at a time when their strategic partnership seems to have come to the end of the road. Then, one might ask how much the sovereign choice of the nations and peoples of Central Asia is worth to the great powers of global politics. 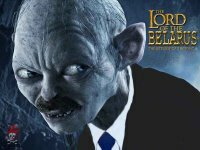 Would a halfling state join and make the giants leave, it might also well constitute the moral choice of halflings and not of the great giants. That is perhaps also the lesson of our times, that when power talks morale steps aside: "Erst kommt das Freßen, dann kommt die Moral." It remains to be seen how Great the Game will be played, and with what appetite. Moscow is now turning from wine to water in Russia's ongoing trade war with Georgia. As of today, Saturday 7 May, Georgia's flagship mineral water - Borjomi - is banned from the Russian market, BBC reports. Borjomi mineral water is Georgia's largest export commodity, and - as with wine - some 80% goes to Russia. A little more than a month ago, Russia banned the imports of Georgian wines. It has now become apparent, that Moscow is waging a trade war against Tbilisi to stifle the weak Georgian economy. As with the wine ban a month ago, Russia's chief epidemiologist, Gennady Onishchenko, blames it on failing purity standards. This comes as somewhat of a surprise to Russian consumers, as the Borjomi trademark has been one of purity ever since tsarist times. For some reason, Borjomi is for long renowned among Russians as the best bottled water on the market, although most western customers would shed it due to its high salinity. Since Georgia's rose revolution, the city of Borjomi has become somewhat of a symbol internationally of the new and independent Georgia. Thus, last Augus t, the leaders of the coloured revolutions - Georgia's Saakashvili and Ukraine's Yushchenko - signed the Borjomi declaration aiming at European and Euro-Atlantic integration to the entire "Baltic-Black Sea-Caspian" area. To the Kremlin, the declaration was seen as anti-Russian and a challenge to Moscow's influence over post-soviet space. 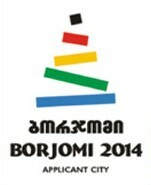 Furthermore, Borjomi is also a candidate for the 2014 Winter Olympics, which but a few years back would have been next to impossible. That the Borjomi mineral water has become the next victim in Russia's trade war on Georgia should therefore come as no surprise. Since Moscow's campaign against Georgian products began, the government in Tbilisi has accused Russia of waging economic warfare against Georgia. Despite Russian assurances that this is not the case, a trade war must now be regarded as a fact to Russians and international observers alike. As for Borjomi's faithful Russian consumers, they might well conclude that "maybe it’s time to send it all to the devil and go to Kislovodsk." On 2 May, Belarus president Lukashenka won the Sixth openDemocracy Award for his great achievements and ingenuity in creating his special "brutal brand of paternalism" and for his excellent parenting methods in fostering the youth of his country to the right values of a just and righteous society. Alyaksandr Lukashenka is the first leader of a post-soviet state that has won this great honour, and he thereby joins the ranks of such illustrious personalities as Silvio Berlusconi, John Howard, George W Bush, Meles Zenavi, and Abu Laban. Above all, Lukashenka's paternalistic batka image impressed immensely on the jury of voters - possibly in combination with his splendid implementation of ideological teaching to the new generation of Belarus. One cannot but feel an irresistable urge to extend one's heartfelt congratulations to Lukashenka for this new victory in leading the people of Belarus towards a bright and promising future. By setting this example, he epitomises the true meaning of his people's aspirations: "Together towards a strong and prosperous Belarus!"